I have been giving some thoughts to my half marathon a few weeks ago. Admittedly, my friend Charlie is the one who brought this up to me, and I think that he is correct. I mean, I think that I need to dissect my race to ensure that I don't make the same dumb mistakes. Basically, I don't know that I was ready to run a PR on this day. I just don't. I mean, obviously that would be nice, but I am not sure that I am in that shape that I was in then. I mean, I needed a few more weeks, a few more tempo runs at HMGP. But because that is not the big picture of this training cycle, Chicago is, and so I am 100% ok with it. However, if you look at the splits for the race, I definitely have work to do toward the end of a race. Mile 11 was 7:50. I mean, that is what I would like to run for the marathon in a few weeks - well, faster, but if I start to slow down at mile 23, that would be ok. But I was able to pick it up after that. 7:38 and 7:20 (my fastest mile of the day) were the last two full miles. So obviously something funky happened during that mile (and to be fair, the end of 10, as that one landed around 730 when I have been running more like 7:22). I honestly think that what happened here was 20 miles related (and therefore fueling related). So I would normally take 2 gels during a half when I am racing. 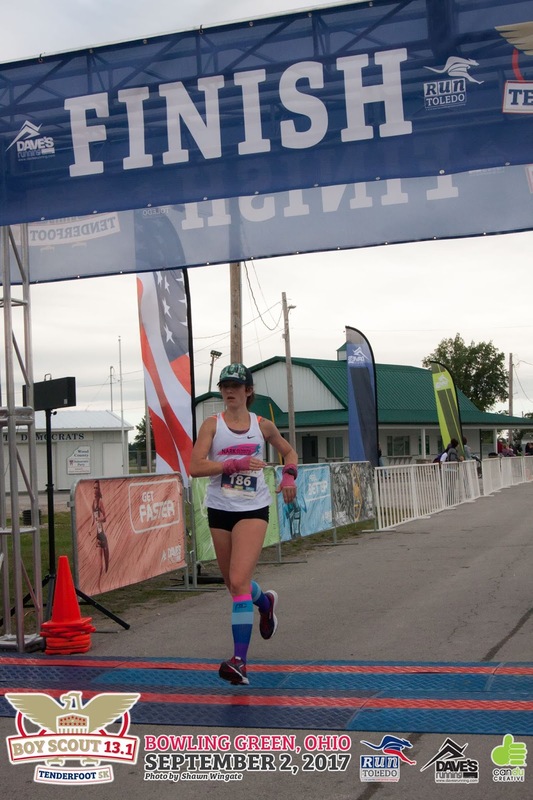 I did take two gels during this race as well, but I think my timing was off. When I ran my PR, I took one at 5 and one at 9. That was after about a mile and a half warm up. 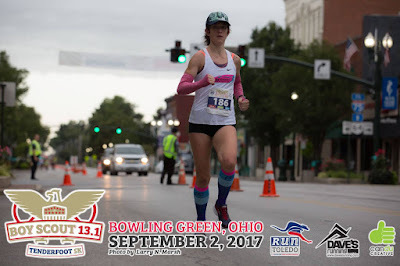 So for this race, I ran two miles as a warm up and took gels at 4 and 10. It was that one at mile 10 that screwed me up. I took it too late. I only brought 2 gels with me, because that is what I would use for a 20 mile training run. And so I wanted to make sure that I would be ok for the 5 miles afterward, so even though I knew mile 9 would be better (so then I would have the caffiene in my system by mile 10-10.5) I put it off. I know better than that. I should have been more prepared. I should have taken that gel at 9. And then SUFFERED through the last 5 (or maybe not suffered, I was allowed to run as slow as I felt like running) rather than trying to ensure that I would be ok. And really, did one mile make a difference? So for this weekend... I am running 5 miles before the race, nice and easy. I plan to take a gel on the start line. I plan to take another during the race (somewhere around mile 5?) and then I will take another during my 6-ish mile cool down. I was given a race plan from the coach, so I am ready to go.